Cologne - Born and bred in Cologne, the city Germans call the Domstadt, Timo Horn is all too aware of the rivalry between his boyhood club, 1. FC Köln, and their Rhine rivals Bayer 04 Leverkusen. Indeed, so aware is Horn, that the 5-1 defeat on Matchday 13 at the BayArena would have hurt more than most. bundesliga.com: Timo Horn, you and your Köln side kept another clean sheet last weekend against Hertha Berlin, as well as picking up an important point on the road to ensuring survival. Was the plan in the capital one of safety first? 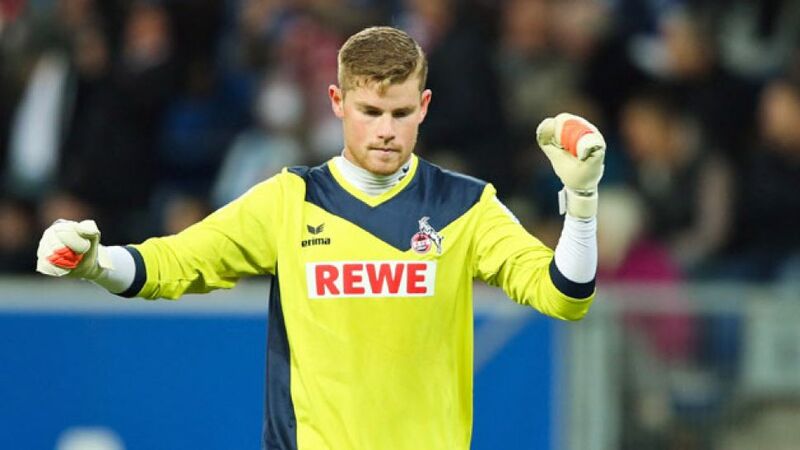 Timo Horn: If we can achieve our targets by being defensively organised, then that’d be absolutely fine. Although there were perhaps a few games this season when we could have done more going forward, at the same time you can't take keeping clean sheets so often for granted. That tells you all you need to know about our good defensive work as a team. Even at the moment we're pretty secure at the back. bundesliga.com: Köln were certainly intent on keeping a clean sheet in Berlin, though, as underlined by the coach Peter Stöger's substitutions. The opportunity to go all out and perhaps take three points with an eye on the UEFA Europa League spots seemed to slip by deliberately. Could that be interpreted as a realistic assessment of your own chances? Horn: I’m not sure if the coach does things especially to be understood as signs or symbols. After beating TSG 1899 Hoffenheim [on Matchday 28], we really wanted to get something in Berlin. You could see that was the case on both sides and that the dangerous situations were only really from set pieces. Neither side took too great a risk. Obviously, by the end, we wanted to take a point. bundesliga.com:Seventh place, which could mean Europa League qualification, is only four points away. Is that really not a topic of discussion? Horn: Right from the start of the season we've had a clear target, which has been to finish 15th or higher. Just as before, that remains our target, and it's one which we’re completely focused on. If we secure that early, then we can play the last few games of the season under a bit less pressure and see what happens. bundesliga.com: Köln haven’t lost any of their [two wins, five draws]. Has the team achieved more security than originally expected? Horn: You can look at that both ways. On the one hand, we've drawn too many games at home, but on the other hand, we've lost very few. Just recently the team has been approaching games more confidently. It doesn’t make much difference to us, though, whether we play at home or away. We’ve really developed as a team this season. There have been lots of games in the Rückrunde which have panned out almost exactly the same as those in the Hinrunde, like the last one against Hertha. In the first half of the season, though, we lost more often, even when sometimes we were the better team. We've definitely taken a step forward by changing that. Horn: That’s true. If the game had gone to plan, we would have been able to take three points. For that reason, the result at the end was really sobering and our biggest loss of the season. It was unlucky. We want to rectify that, particularly because it’s a derby. If we can keep a clean sheet, we’ll already be halfway there. We’ll try to do that, even though it’ll be really tough against Leverkusen's outstanding attacking unit. bundesliga.com: You've been at the club for a long time and have been playing in these derbies since your childhood. Has the rivalry always been something special? Horn: Absolutely. Back then I played in a Middle Rhine representative team with some Leverkusen players, like Danny da Costa [now at FC Ingolstadt 04] and we'd always wind each other up. Having said that, the really big one for me is always against Borussia Mönchengladbach. bundesliga.com: Roger Schmidt's side have won the last seven games in a row and can establish a new club record in Cologne with a win. Is being the side able to prevent that additional motivation? Horn: Obviously that brings a certain spiciness to proceedings, but mainly, it’s a derby and nothing matters other than that one side is hunting a UEFA Champions League spot and the other looking to stay up. On the day, we want to give the fans something to cheer about and keep the points in Cologne. bundesliga.com: How are you approaching the game? Horn: Leverkusen are a top side and for that reason, we’ll have to remain resolute defensively. If you walk into a trap, it can quickly backfire. We also know, though, that we only need one or two more points to be sure of survival. For that reason, we’ll try to play well and confidently on home soil, but not to allow Leverkusen to counter. Timo Horn was speaking to Tobias Gonscherowski.